* The Martin Pro-draft Professional Parallel Straightedge is cutting edge technology. 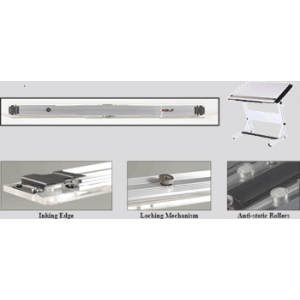 * Aluminum body for strength and stability, Anti-warp cast acrylic bottom with ink edges, locking device to lock in any angle that you would like to draw, and anti-static rollers to avoid smudges to your drawing. * (Suggestion: Consider a straightedge about 6" shorter that your table to allow for other materials, etc).